I'm looking for a couple of jackfruit trees to add to my collection. I have the NS-1, Amber, Lemon Crunch and one unknown. Hopefully Harry or one of you other experts can guide me as to what else to add. My grafted Amber is in the ground, 3 years old and only 3' tall with 4 fruit on it. I'd like the tree to be at least 3 years old or older and I can pick it up. Anyone have a copy of Harri Lorenz's' Frutas No Brasil' they'd care to part with? I'm looking for the hardback copy. Does anyone what this tree is? The seed was sold to a friend in 2015 as a Nangka Mini/Dwarf Jackfruit but it doesn't look like one. Any help on an ID would be appreciated. Does anyone have seeds to the Nangka Mini/Dwarf Jackfruit? I really is a remarkable plant and mine bloomed in 1 1/2 years from seed. I had a couple growing and fruiting but a landscape contractor destroyed them. Looking for scions of mamey spate. NOT Pantin, Magana or Papa. I have those. Can trade in plinia if interested or simply cash. Does anyone know of any good rare fruit nurseries in Homestead or Davie that specialize in unusual and hard to get fruit trees? Can anyone recommend a deep orange, crispy and relatively latex free jackfruit variety? Mine are soft and yellow fleshed and I'd like a change taste and texture. I saw one in one of Pete Kanaris's latest videos but they were eating it on a farm in Costa Rica and didn't give the name of the variety. Here's the link if you'd care to watch. The jackfruit is at around the 21:00 mark. Is anybody growing EVIARC Sweet Jackfruit? I thought these would come back but they're dead. The Pickering mango and vexator were great producers. The vexator produced thousands of fruit a year. I have a bunch of these. Offer whatever you seem is a fair price. See my post in the Tropical Fruit Discussion area. These seeds are available. Picked today. $7 each plus $2.60 domestic shipping. Just to end any controversy about the seeds I've offered as Otto Anderson. Pictures I've posted were of almost ripe fruits and they had a reddish tinge to them and a Brazilian member was quizzical about this and didn't think it was the real thing. Here is a photo of the ripe fruit. As I stated before this is known Plinia Açu Paulista 'Otto Anderson' and is probably the best tasting of any known jabuticabas. These seeds are available if anybody wants them. Picked today. $7 each and $2.60 domestic shipping. I have 16 fresh p. coronata restigna seeds available. $6.00 each.....2 seed minimum plus 2.50 shipping. I'll be taking my NS-1 jackfruit to Fruitscapes Nursery in a couple of days. If anybody wants any let me know before Thursday. I have 9 p. aureana seeds harvested today. $5 each with a minimum purchase of 3. Shipping is $2.77. Email me (don't respond here) at the same email address. Ripe Jackfruit (NS-1) from around 5 pounds to 30 pounds on the tree at $2 per pound. Call, text or email me. Don't PM me. Fresh Grimal seeds harvested today (5/13/17) and for sale at $3 each with a minimum of 5 seeds. I have over 200 fresh seeds available. My passiflora quadrangularis fruit are growing nicely. To have fruit set I usually have to hand pollinate this species. I cross pollinated p. lauriflolia with my quad and am waiting to see what happens. Plinia sp. 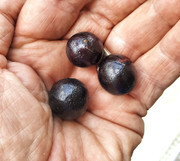 jabuticaba-açu-paulista 'Otto Anderson seeds. No longer classified as a phitrantha. $7 each with a minimum of 3. shipping is $2.60. I only have 22 seeds and they are fresh from the tree today...5/5/17. Grimal seeds are available. $3 each with a minimum of 5. Domestic shipping is $2.60. One of my cambuca's is blooming again. Hopefully the tree rats, squirrels and birds will keep their distance. I'll try to remember to wrap the fruit in aluminum foil. My Otto Anderson trees are fruiting again. I'll have seeds if the wild things don't get them first. Let me know if anyone is interested. 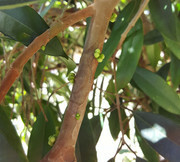 My Grimal trees are fruiting again. Hopefully the wild things will ignore them. Anybody need seeds?